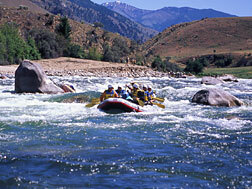 Experience Idaho's Middle Fork of the Salmon River. It's spectacular beyond imagination, it carves through 106 miles of the most rugged inaccessible and primitive country in the United States - a country still relatively untouched by man. There are no roads. 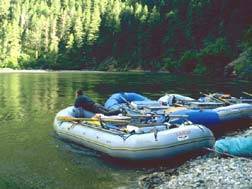 A rafting trip on the Middle Fork of the Salmon is one of the great wilderness experiences left in the lower 48. 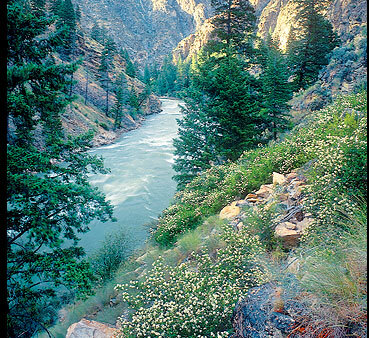 The Middle Fork churns its way through one of the largest wilderness areas in the United States¹the 2.4 million-acre Frank Church/River of No Return Wilderness in the heart of central Idaho. Rafters running the Middle Fork may hear the cries of wolves as they settle into their comfortable sleeping tents; they’ll certainly thrill to the majestic cliffs of Idaho Batholith that line the river canyon. In the course of our 106-mile float, you’ll encounter more than 300 rapids. Some are gentle class I riffles accessible to beginning paddlers; others are heart-pounding class III and IV runs, rapids that have helped make the Middle Fork one of the most prized white water rivers in the world. are legendary in white water circles; you’ll experience them all as we make our way down the river.